Opening the chest to operate directly on an exposed heart is major surgery. For many years the procedure was considered impossible because performing the operation would cause the heart to stop beating. A few pioneers, however, did perform emergency surgery directly on the open heart. One of the first was African-American surgeon Daniel Hale Williams (1858-1931). Williams opened the chest of a stabbing victim and sewed up the pericardium (the sac surrounding the heart) in 1893. The success of the surgery made headlines in the Chicago Daily Inter-Ocean. A coronary artery blocked by plaque. question. If the heart was being repaired, there had to be a way to keep the blood oxygenated and circulating. Without the an outside device, the patient would surely die. An American surgeon named John H. Gibbon, Jr. (1903-1974) devoted himself to solving this problem in the 1930s. Assisted by his wife Mary, Gibbon developed a workable pump-oxygenator in 1931. This heart-lung machine shunted (switched) blood from the veins through a catheter (a slender tube) to a machine. The machine supplied the blood with oxygen and then pumped the blood back into the arteries. On May 5,1953, Gibbon ushered in the era of open-heart surgery by using his heart-lung machine on a patient suffering from heart failure. In the procedure, Gibbon connected patient Cecilia Bavolekto to the machine and closed an opening between her heart's atria (upper chambers of the heart). Doctors perform open-heart surgery. Today, the procedure is used for both the replacement of defective heart parts and repair of cardiac malfunctions. 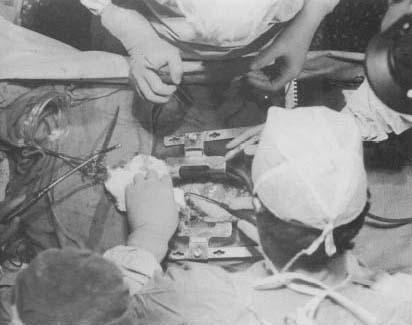 The methods and technical details of open cardiac surgery were refined throughout the 1950s by a number of surgeons and engineers. Most notable of these were Owen Wangenstein at the University of Minnesota and John W. Kirklin at Minnesota's Mayo Clinic. By 1960 open-heart surgery had become fairly standard. Open heart procedures began to be used for replacement of defective heart parts and not just for repair of cardiac (heart-related) malfunctions. Surgeons Albert Starr and M. L. Edwards of Portland, Oregon, designed a ball-and-cage artificial heart valve and successfully implanted it in a 52-year-old patient in 1961. The heart gets its blood supply from the coronary arteries that branch off from the aorta. These arteries tend to become narrow from accumulations of plaque (blockage), which also promotes clot formation. When the coronary arteries become blocked the result is severe chest pain, or angina, and in some cases a heart attack. Rene G. Favalaro introduced coronary artery bypass surgery in 1967. Favalaro and his surgical team at the Cleveland Clinic devised a technique that included creating an alternate blood pathway. They did this by grafting (transplanting) a vein from the patient's leg to bypass a blocked portion of a coronary artery. This bypass surgery was made possible by the use of microsurgical techniques and Gibbon's heart-lung machine. 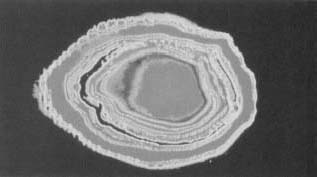 Favalaro also used coronary arteriography (which produces a direct image of the heart prior to open-heart surgery). Within three years of Favalaro's pioneering 1967 operation, coronary bypass surgery gained wide acceptance. Its use in cases of mildly clogged arteries dropped off in the late 1970s with the advent of balloon angioplasty. Perhaps the most dramatic development in open-heart surgery was the heart transplant. This procedure was first successfully performed in Cape Town, South Africa, by Dr. Christiaan Barnard in 1967.
i want to thank you for the information you have given me for my Science Fair project!! Again thank you so much!! I am looking for the Best heart surgeon in South Africa with alot of experience in replacing heart valves. What are the causes of heart disease and what are the after effects? Also where can i find help with immediate effect, because i am experiencing problems with my heart beats. I also would like to know what sort of nutrition is healthy for my heart?